Our Lavender Laundry Fragrance is the ultimate in aroma therapy. 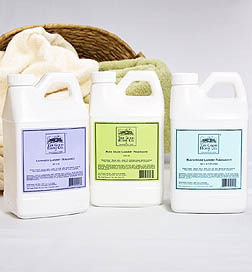 This Lavender Scented Fabric Softener will have you thrilled to do your laundry. Just add 1/3 of a cup of Lavender Scented Laundry Fragrance to your rinse cycle water for an amazing softening fragrance for all your washables. Calming and relaxing, our Lavender fragranced products will bring the essence of Provence into your home. Once you try them, you won’t ever be able to wash without! Lavender Laundry Fragrance is available only in the 64 oz. refillable plastic container. Do not use on flame resistant clothing as it may reduce the resistance.